Do you have applications for flow measurement that cannot be solved with a flow meter due to the cost? If you have ever wanted proof that CIP flow has returned or needed a simple flow/no flow indication to a filler to avoid freezing up a heat exchanger, then you have probably encountered this need. 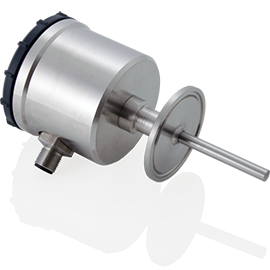 If either of these applications ring a bell or a similar need exists in your plant then the FTS-741 calorimetric flow switch will provide a robust, economical solution to these types of applications. The application involving a flow switch on a CIP systems centers around the need to confirm that liquid which is sent out by a CIP system returns back to the skid. Making this determination identifies possible problems in the cleaning loop connections and failures in the loops components such as hoses which can result in safety issues and damage to processing areas. By design, a CIP system will use a flow meter to control the discharge rate of the system and this is important to ensure the effectiveness of the cleaning process, but this meter does not give indication of the liquid returning to the skid. To make this measurement, a second flow meter would need to be fitted on the return line of the skid, but the return line measurement of flow does not require the precision as when a problem occurs it will be a significant change that needs to be identified. To cost effectively make the determination, a FTS calorimetric flow switch is used to give an indication when a flow velocity on the return line is meeting a pre-programmed set point. It in turn will provide a digital output to the skid control system all at a fraction of the cost of a full-fledged flow meter. 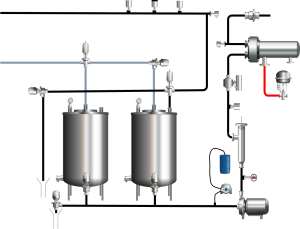 In processes where the product is either heated or cooled there can be a disconnect between operation of the temperature system and the actual flow through the system. This can commonly occur on filling systems where the product may be heated or cooled before filling. In these instances, it can happen that flow is stopped at the filler but the heating or cooling system will continue to function until the temperature measured on the discharge of the heat exchanger indicates it is time to shut off. Often this can lead to freezing or over heating of the product. By the simple addition of an FTS flow switch on the product line and integrating the switched output into the thermal control, the determination of whether the product is flowing can be used to control the heating or cooling media avoiding the excessive heating or cooling. 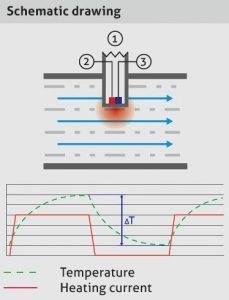 energy is removed from the heated temperature sensor and the ΔT changes in relation to the flow rate. It is by measuring this change in the ΔT that a velocity calculation can be made. The calculated velocity is then compared to a programmed value to determine if the switch output should be on or off. 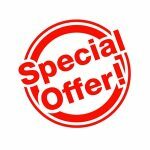 To Help with your project we are offering a special limited time PER code. Use this code when placing your order for an FTS before August 31st, 2017 and receive 5% off your Flow Switch. This is a limited time offer. This offer may not be combined with any other coupons. Please contact CustomerService@Anderson-Negele.com for more information.